This will be the last off topic sports posting - honest ! OK, so we lost to the Giants, 13 - 10, the royal 'we' in this case being my beloved Miami Dolphins. Wracked by injuries, second string QB, pouring rain, and 0-7 going into the game - lets face it it was never going to be like the last Dolphins game at the old Wembley (when we beat the 49ers in a gripping game). To be honest, it only became really apparent how wet the field was, and how badly it coped when watching the highlights on TV when I got home. 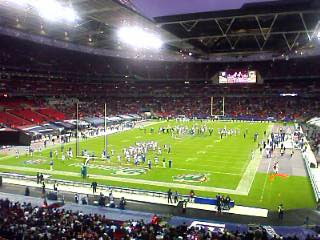 The new Wembley impressed me, nice stadium, but then I had a posh " Club Wembley" seat (£125 / $250). We had the hilarious British sporting institution of a streaker, who appeared to be mimicking the acitons of Homer Simpson when he was the 'mascot' for Springfield's nuclear plant baseball team ! I thought the amptmosphere was good, and hopefully the Dolphins are proud of us, as it was a Dolphins "home" game, and Wembley was their 'house' last night ;-) Although I heard one chap saying it was not very loud compared to a 'real' NFL game and the "Brits are too reserved". Not so, but then, the guy behind me giving a running commentary to his 3 mates, from the same rugby team, shows that not every Brit there is a fan of, and therefore knowledgeable on the rule s and the game. This article from USA Today shows that not all the armchair pundit's in the States thought it was a good idea. As for their comment that we were boo-ing the Giants for running down the clock - of course we understood what was going on, but it does'nt mean we had to be happy with it ! All in all, a great night, not a great game, but I hope both teams enjoyed the welcome, we enjoyed having you over ! p.s. to the two young American gentlement who sat next to me; when everyone stands for your national anthem, but you sit down, pick up your beers and start chatting, whilst my fellow countrymen and I actually sing ours, this is exactly the ignorant behaviour that ends up with all Americans being tarred with the same brush - shame on you ! As a Redskins fan I support whoever is playing Dallas, Philadelphia, or the New York Giants, so last night I was a Dolphins fan too, and was sorry to see they couldn't win this one. But at least you got to see the new Wembley, a streaker, and Dolphins cheerleaders, all of which sound like good consolation for you. On the other hand, I got to see the Patriots barely squeak by the Redskins in a nail-biting 52-7 game. To make it interesting, the Redskins allowed the Patriots to score 52 points in the first three and a half quarters, but it was touch-and-go in the last half of 4th as the Redskins mounted a heroic comeback and scored their first seven points with three minutes remaining. Unfortunately, the clock ran out before the Redskins could notch 45 points (a paltry 6 touchdowns plus field goal) in the final three to tie the game. Fortunately, three-time Superbowl winning skipper Joe Gibbs had a rousing, definitive statement following the narrow loss: "How do we deal with this?" Gibbs said. "I don't know. I think it's something we have to play out and see how we all react." Inspiring words indeed.